We are beginning our fifth year of monitoring inversions in Missouri. In 2017 we started expanding our inversion monitoring network and also began studying how inversions affect dicamba applications – thanks to partnerships with colleagues at other states and funding from the United Soybean Board, Missouri Soybean Merchandising Council and USDA. As we gear up for the third year of the Xtend system and the launch of the Enlist system, maybe it is time to step back and reflect on what we have learned and observed about inversions over the last four years. Each location shown in Figure 1 is being studied for inversions at heights relevant to ground pesticide applications. In June and July of 2018, inversions formed more than 60% of evenings as summarized in the graph of Figure 2. For each of the three original sites (blue counties in Figure 1), inversions occurred routinely over the course of 2015, 2016, and 2017 across the growing season months of April, May, June, and July. Figure 1 Network of inversion monitoring stations that are tracking inversions at heights relevant to ground pesticide applications. Counties in blue indicate the 3 original inversion monitoring stations which were equipped in 2015. Counties in red indicate newer inversion monitoring stations that went online in 2017 and 2018. Click to enlarge. #2. Inversions begin forming prior to sunset. Between 5 p.m. and 6:30 p.m. in April. Between 5:30 p.m. and 6:50 p.m. in May. Between 6 p.m. and 7 p.m. in June. Between 6 p.m. and 8 p.m. in July. All of this depends on the location. One year’s worth of data from June and July for all the additional stations (red counties in Figure 1) suggest the trend is fairly consistent across the Midwest and Midsouth with a few caveats that will be explained in the next points. Figure 2 The percent of evenings in June and July of 2018 that inversions formed. An inversion was defined as air temperature at 18″ being cooler than air temperature at 120″. #3. A field’s surroundings influence the time when inversions form. Tree lines and buildings can obstruct wind. When the prevailing wind is obstructed, inversions seem to begin forming more quickly compared to open areas. Figure 3 illustrates this concept. Figure 3 Obstructions to wind can result in inversions forming more rapidly. 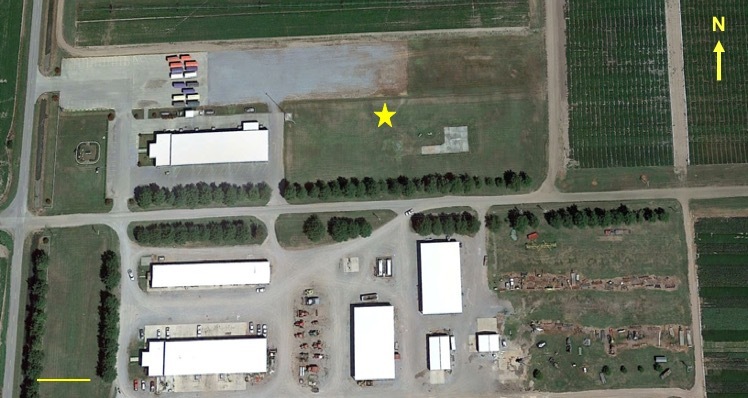 In this example the star marks the location of the inversion-monitoring weather station. A tree row 125′ to the south of the weather station provides obstructions to the prevailing southern wind. Inversions typically form earlier at this location compared to other sites. Click image to enlarge. Prevailing winds are from the south and are blocked by the tree line. Inversions typically form more quickly at this site compared to other sites in Missouri. To summarize points 2 and 3: two neighboring fields are probably equally likely to have inversions form on a given evening. However, obstructions may result in inversions forming earlier in one field compared to the other. #4. Cool air is going to find the lowest point of a field. Inverted temperatures result in cool air masses; those air masses are going to find and settle in the lowest point in a field. In some field observations, dicamba injury shows up in the lowest areas of the field. Figure 4 Air samples were collected and measured for dicamba levels following application during inverted air temperatures (black bars) and daytime, non-inverted air temperatures (gray bars). For the first 8 hours following the dicamba applications; there is much more detected from the applications made during inversions.. Click to enlarge. Sometimes the injury is attributed to water run-off after heavy rain events. However, these patterns can also be indicative of dicamba that was applied during an inversion and moved with the cool stable air mass. #5. Mobile apps are still in the validation stages. Most inversion forecasting apps use models that are based on weather data obtained at much higher heights in the atmosphere. There is a lack of validation with weather data that is collected at heights relevant to dicamba and 2,4-D applications. The best indicators of inversions are real-time weather data and environmental “cues” such as reduced winds and clear skies. For more information on accuracy of weather apps, please visit Dr. Joe Ikley’s video presentation: Ground Truthing Weather Apps for Wind Speed and Temperature Inversions. #6. Dicamba can be detected in the air more readily following application during inverted air temperatures. 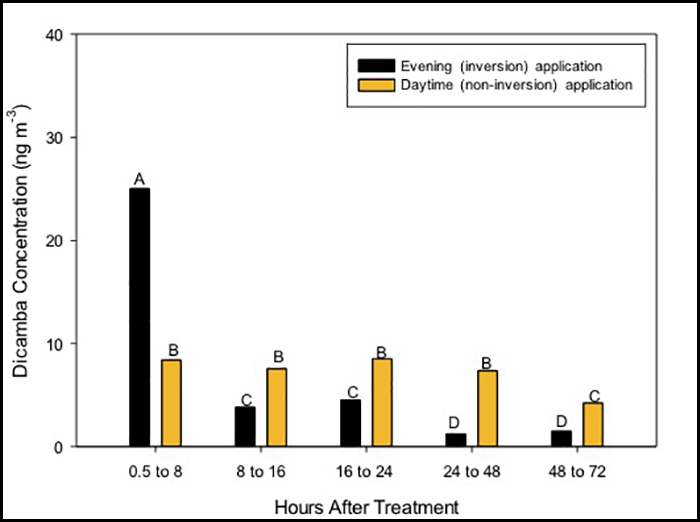 We can detect 3 times more dicamba following an application made during inverted air temperatures compared to an on-label application made during the day (Figure 4). Our research applications were conducted on 10′ x 120′ strips of Xtend soybean treated with a labeled rate of Xtendimax with VaporGrip plus Roundup PowerMax. The amount remaining in the air causes injury to our control, non-dicamba resistant soybean plants. Imagine what spraying an entire field during inverted air temperatures could do. #7. Smoke bombs are good indicators of inversion forming. We typically use the Enola Gaye Smoke Grenades (Figure 5). Generally, if the smoke cloud dissipates in less than a minute or so, temperatures have not started inverting. However, the smoke grenades are only indicators. 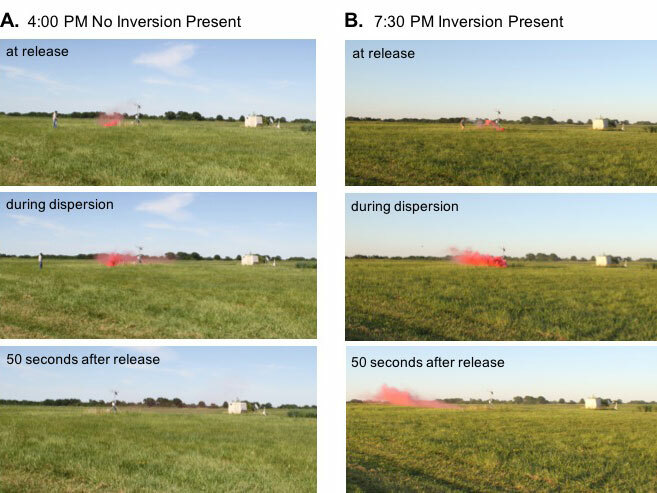 Figure 5 Smoke bombs can serve as visual indicators of inverted air temperatures. When temperatures are not inverted (A), the smoke bomb dissipates. When air temperatures are inverted (B), the red smoke lingers and suspended particles can be moved by wind. The weather station monitoring the air temperatures is in the middle of each photo as a height reference; it is 120″ in height. Dicamba may not behave exactly like the smoke grenades or may be more sensitive to temperature changes. We have learned and continue learning much about surface temperature inversions. Real-time data, such as Missouri’s inversion monitoring web site, and indicators such as wind speed and cloud cover can help applicators identify inversions. Sounds and smells are typically amplified during inverted air conditions as well. More information on dicamba and weather surrounding applications can be found on Mizzou Weed Science’s Web site.